A few years ago the right of way for an automobile boulevard was donated to the city by the heirs of the estate of James Terwilliger. Since it’s completion this highway, called Terwilliger boulevard, has become one of the popular and widely-known pleasure drives of the city. 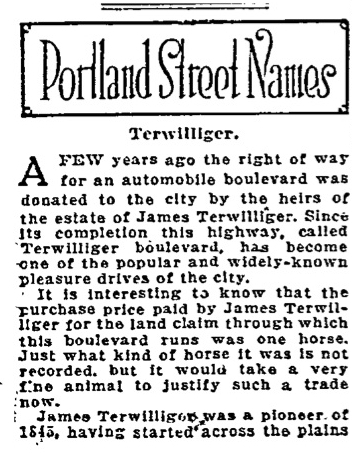 It is interesting to know that the purchase price paid by James Terwilliger for the land claim through which this boulevard runs was one horse. Just what kind of horse it was is not recorded, but it would take a very fine animal to justify such a trade now. James Terwilliger was a pioneer of 1845, having started across the plains in that year from Illinois, settling in Multnomah county upon his arrival and living here until his death, September, 1892. He was born in New York state October 2, 1809, of Dutch ancestry, and lived for a while in Ohio before moving to Illinois. 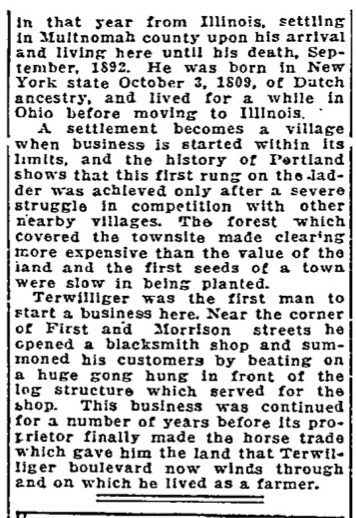 A settlement becomes a village when business is started within its limits, and the history of Portland shows that this first rung on the ladder was achieved only after a severe struggle in competition with other nearby villages. The forest which covered the townsite made clearing more expensive than the value of the land and the first seeds of a town were slow in being planted. Terwilliger was the first man to start a business here. Near the corner of First and Morrison streets he opened a blacksmith shop and summoned his customers by beating on a huge gong hung in front of the log structure which served for the shop. This business was continued for a number of years before its proprietor finally made the horse trade which gave him the land that Terwilliger boulevard now winds through and on which he lived as a farmer.